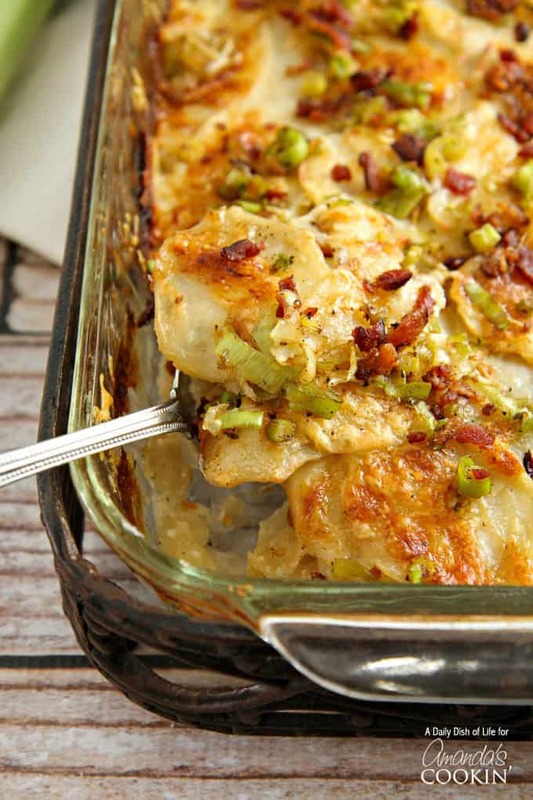 A tried and true family favorite, this Potatoes Au Gratin is packed with cheesy bacon goodness. 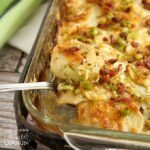 The perfect comfort food casserole, au gratin potatoes are a wonderful side dish for a special occasion. It’s hard to decide which to make, these amazing au grating potatoes or our garlic & rosemary roasted potatoes! If you’re looking for comfort food, Potatoes Au Gratin is it. My late father in law made a version of these potatoes at every holiday dinner as far back as I can remember. 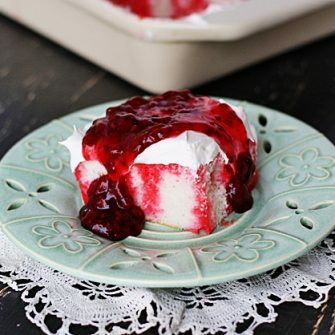 It is one of my kids’ favorite recipes, and there are seldom any leftovers, no matter what else is on the menu. 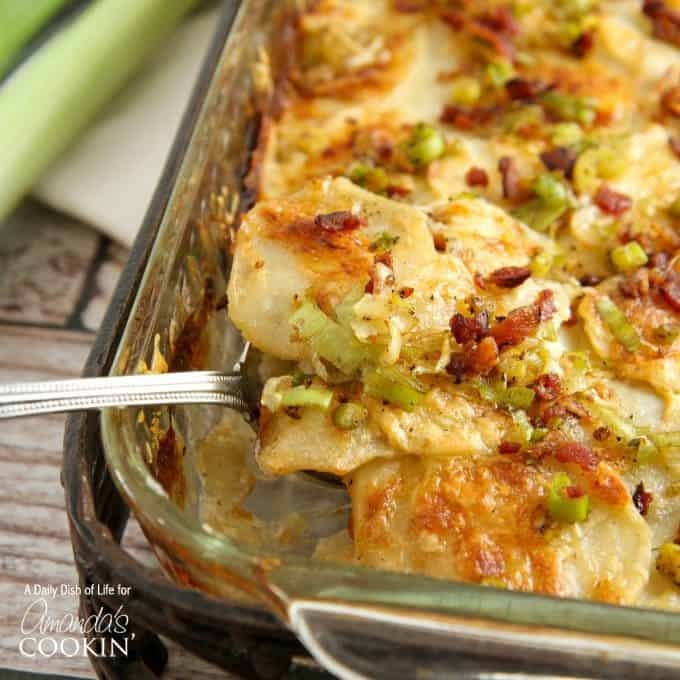 Because I am always playing around with recipes, I’ve updated them to use two kind of cheeses that complement each other and added a topping of delicious bacon and sautéed leeks. This side dish casserole recipe looks more complex than it actually is. You are going to love the flavoring that the horseradish and Dijon mustard gives the sauce. The key though is using a wire mesh strainer to strain the horseradish from the light cream and chicken broth mixture. Afterwards you’ll discard the strained horseradish. By mixing it with the light cream and chicken broth, it gives it a nice flavor without being too strong. If you use a strainer with bigger holes, the horseradish flavor can be a bit overpowering. If you’re planning a special meal, this Potato Au Gratin recipe pairs well with my Orange Marmalade Ginger Glazed Ham and my Spinach Salad with Pomegranate Balsamic Vinaigrette Dressing! 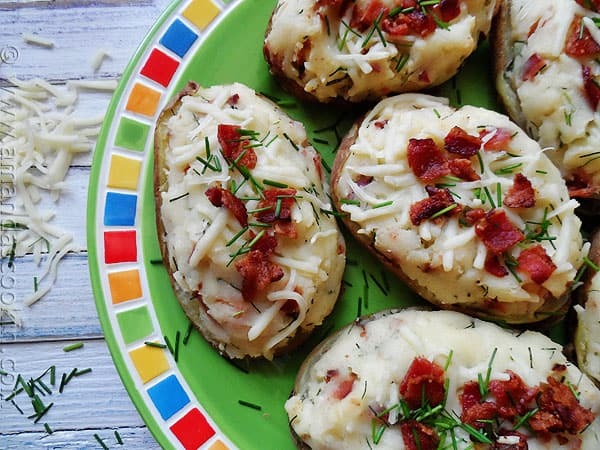 These Cheesy Bacon & Chive Twice Baked Potatoes make a fabulous side dish. They can even pass as an appetizer, similar to potato skins! 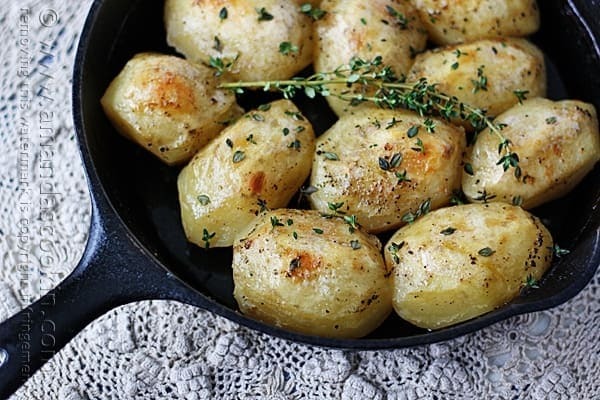 I guarantee you will love these Roast Potatoes in a Cast Iron Skillet. They are tender on the inside, full of flavor from the chicken broth and perfectly browned on the outside. 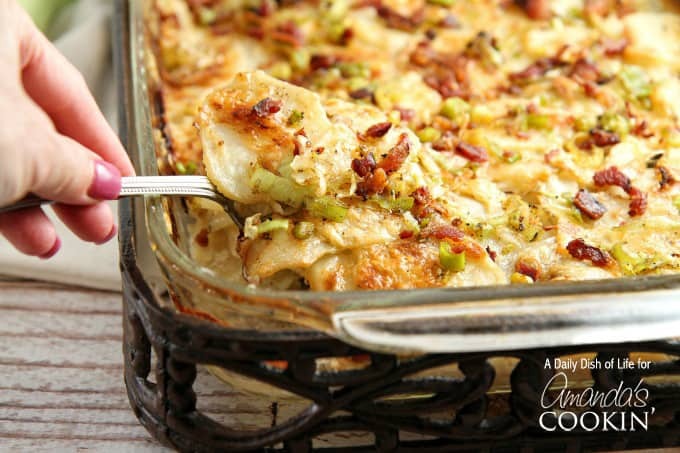 Bacon Topped Three Cheese Potato Casserole is a real show stopper for those that love cheese! Sprinkle with chopped green onions to add a third color for a beautiful presentation. And even more recipe ideas. 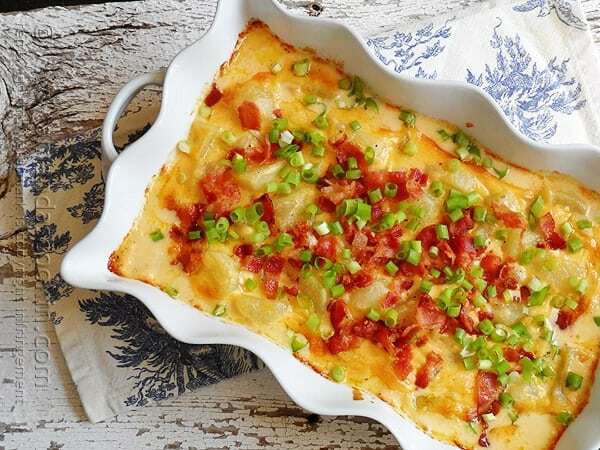 A tried and true family favorite, this Potatoes Au Gratin recipe is packed with cheesy bacon goodness...the perfect comfort food and a wonderful side dish for a special occasion! Preheat your oven to 400 degrees. Prepare a 9" x 13" baking dish by spraying with cooking spray or greasing with butter. Combine light cream, chicken broth, Dijon mustard and horseradish. Whisk to combine; set aside. Peel potatoes and slice with food processor into thin slices. (You will need a special attachment for this). Strain your light cream / chicken broth mixture through wire mesh strainer into another bowl. The horseradish will be left behind in the strainer, and you will not be using it. Layer 1/3 of your potatoes in your prepared baking dish. Sprinkle with salt and pepper. Top with 1/3 of the cheese mixture, and then pour approximately 1/3 of the light cream / chicken broth mixture over the top of the potatoes. Repeat the layering process two additional times. Bake for approximately 1 hour, until potatoes are fork tender, and the top is golden brown and little crusty. While potatoes are baking, cook 3 slices of bacon, drain and crumble. Reserve about 1 tablespoon of bacon grease to sauté leek rounds. Once softened, drain on paper towels. When potatoes have about 5 minutes left to cook, top with bacon and leeks. Cool for 10 minutes or so before serving. If you don't plan to serve right away, cover with aluminum foil until ready to serve. When you slice your potatoes, you may find that they turn pink. To avoid making your dish with pink potatoes, simply place the potato slices in a bowl of cold water and drain them when you are ready to use them. The water will turn pink, and the potatoes will return to normal color. Michelle is a food blogger, avid photographer, runner, and of course Mom! Her blog, A Dish of Daily Life is a lifestyle blog where you’ll find healthy recipes (most of the time! ), helpful how-to’s, her best travel adventures and tips, and a little bit of her daily life as well. Can I substitute garlic for the horseradish? A lovely recipe. Thank you and have a great day!